Inside: What paperless kitchen products do you actually need? 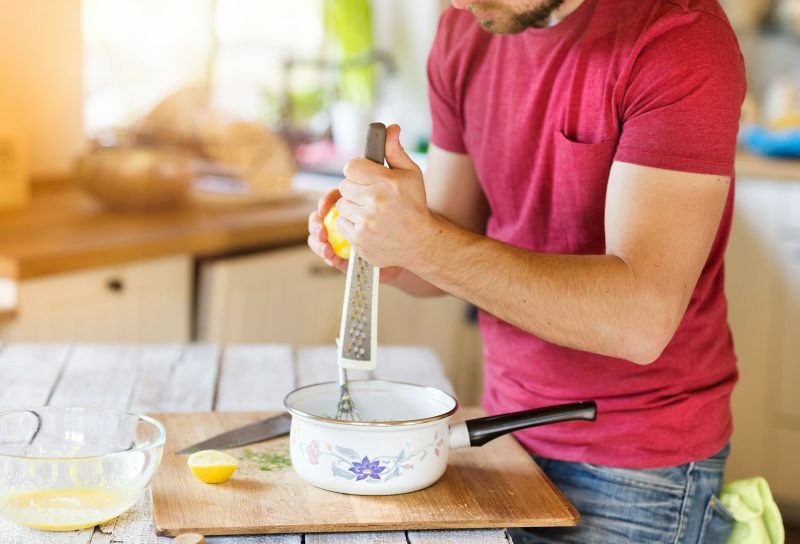 This master list of paperless kitchen products will help you get started on the right foot! Now that you know why a paperless kitchen makes your mom life easier, and the best tips to start your paperless kitchen, it’s time to talk products. 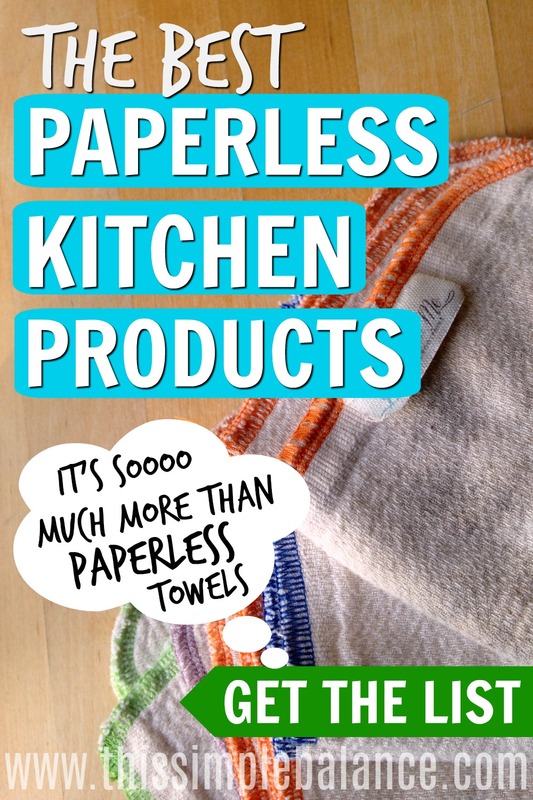 What paperless kitchen products do you actually need? The only thing on my mind last summer when I got this crazy idea was paper towels. We needed to ditch the paper towels, or at least cut down significantly on the quantity we ripped through every week. But once I entered the whole new world of green living, I realized that a paperless kitchen was SO MUCH MORE than just unpaper towels. A paperless kitchen isn’t just unpaper towels. The possibilities for going paperless (and saving money!) are endless. Cloth mop pads, dishcloths, rags, cloth napkins. The list goes on and on and on. There were so many things I had never even thought of! Before you get overwhelmed with the thought of how much all this is going to cost you, calm down. It’s gonna be o.k. The grand total if we bought every possible thing we could buy to get started freaked me out, too. First remember this: you don’t need to buy it all right this second. You can ease your way into a paperless kitchen. Second, there are so many options for how to about starting your paperless kitchen. It doesn’t need to cost you much at all, actually. If you decided to purchase everything on this list today, the initial start-up costs of a paperless kitchen are going to be a little steep. But when I started? I simply ripped up some old t-shirts and used those while we saved for some nicer unpaper towels. I am going to list some of the nicer paperless products we eventually upgraded to (knowing it would save us money in the long run), but there are definitely ways to avoid the pricier versions of these paperless products. Did you miss posts #1 and #2 of this series? Find all my Paperless Kitchen Posts HERE. You can save money by shopping your local thrift store for dish towels and cloth napkins. You can make your own unpaper towels using old t-shirts. Target frequently slashes the prices on their dish towels at the end of season, and you can pick up several for up to 75% off (with their REDCard, you can save 5% more, too!). While we do have a sewing machine, sewing is really not my thing (it’s my mom’s and now, my daughter’s). It would probably take a ridiculously long time, more time than it’s worth, for me to make unpaper towels. 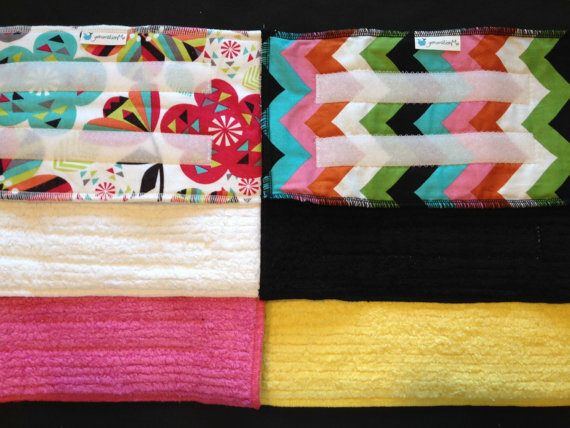 Sewing-impaired me would much rather buy paperless towels from a fellow mompreneur who is trying to support her family. What you decide to buy in the beginning is up to you: your budget, your skills, your time, your convictions. If you love to sew,for example, these DIY cloth napkins will probably be an easy and fun afternoon project. For me, it would be an afternoon of frustration. The bottom line? It’s up to you to decide how much money you want to spend initially. Just know that a paperless kitchen will save you money in the long run. Get cash back on both Amazon AND Etsy when you start your shopping trip on BeFrugal.com (plus a BONUS $10 after you earn $10 cash back when you sign up through my referral link). These dish cloths from Scotch-Brite have raised patterns on one side and smooth cloth on the other. You can use them to scrubs dishes, wipe down counters, and spot clean your kitchen floor. I go through one a day between all these tasks. They start to smell after a day or two. I currently have ten of these, which is about right for doing a load of kitchen laundry once a week. I use these unpaper towels for wiping down crumb-covered counters and cleaning up non-sticky spills. We currently have twenty-four two-ply unpaper towels from Generation Me, and I am considering ordering the one-ply unpaper towels to use as cloth napkins. I know families who have up to sixty unpaper towels and do one load of kitchen laundry a week. Because I use these in conjunction with old dish towels for larger spills, I don’t need as many. You may need more; you may need less. If you are handy with a sewing machine and have a lot of old t-shirts (good incentive to start decluttering! ), this tutorial shows you how to transform your old t-shirts into unpaper towels for an even thriftier alternative. I recommend starting with one or two sets of 12 and buying more as needed. Note: While I did start with rags, I noticed a major difference in the absorbency of the unpaper towels I purchased compared to rags. I went through a lot more rags every day, and it was more challenging to pick up certain messes with them. You can do rags, but I personally think these do a better job. Cloth napkins are next on my list of things to purchase. Again, I would love to find another mom on Etsy to support. That being said, you can find them on Amazon, or any major retailer, really. You can also use the tutorial listed earlier to sew your own. There are some messes I’d rather not use unpaper towels to clean up. The artwork my toddler made on the kitchen table earlier today with Crayola markers, for example (thank God, they’re not the expo markers he used on the wall!). I’d also rather not use my nicer paperless kitchen products on all the delightful bodily fluids that come with little ones. Old t-shirts torn into strips work really well for these kinds of jobs. I prefer dark colors because stains don’t show up as much, but any color gets the job done. I use a combination of dishcloths and this dishbrush to scrub dishes. I definitely need both to get the job done. I use dish towels for drying dishes, drying vegetables, and cleaning up big spills. We currently have 15-20 dish towels, and it seems to be sufficient for doing kitchen laundry once a week. I purchased a Swiffer several months ago, and I really don’t know why. I hate mopping – hate, hate, hate it! Ironically, the swiffer ended up being a dud (one of the sprayers didn’t work from the start). 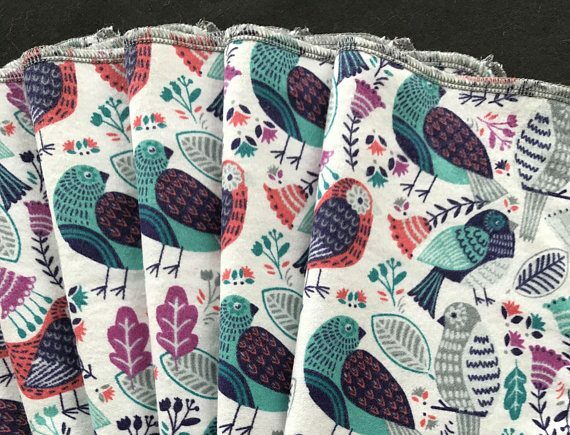 I picked up these reusable mop pads from Target, but then as I was purchasing my paperless towels, I discovered these reusable mop pads in the same Etsy shop. They are efficient and absolutely adorable. I use them in conjunction with Method’s Squirt and Mop. It’s not the most frugal product in the world, but it makes me more likely to do a chore I hate. Sometimes, as a busy homeschooling mom, you just need to spend the extra dollar to get the job done. I have not made the leap to cloth baby wipes for bottoms yet, but where we go through baby wipes the most is in the kitchen, cleaning up the toddler after mealtime. I picked up simple packs of washcloths similar to these ones at the recommendation of a reader (thank you!). This should cut down on our baby wipe usage. Now, Go Start Your Paperless Kitchen! Well, now you have everything you need to start your paperless kitchen. You know why it will make your life easier, tips to help you get started, and products that will save you money in the long run. The most important thing to remember is again, baby steps. Swap out one product at a time and make your way toward a healthier, more frugal kitchen. I really love when saving the earth means saving time and saving money, too. You can’t beat that! I hope you enjoy a paperless kitchen as much as I do. Oh, I love all these recommendations! We have a few “nice” cloth napkins but not enough for everybody, so I’m definitely going to check out those beautiful Etsy ones.